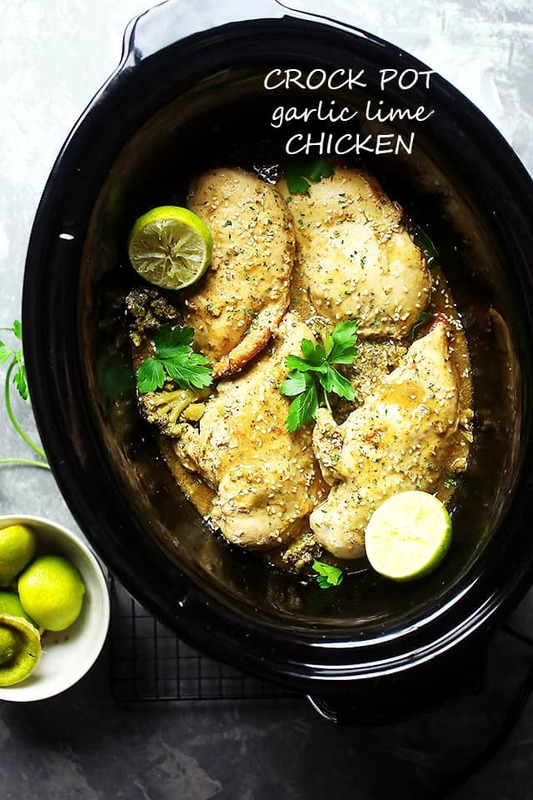 Crock Pot Garlic Lime Chicken – An easy slow cooker chicken breasts recipe! 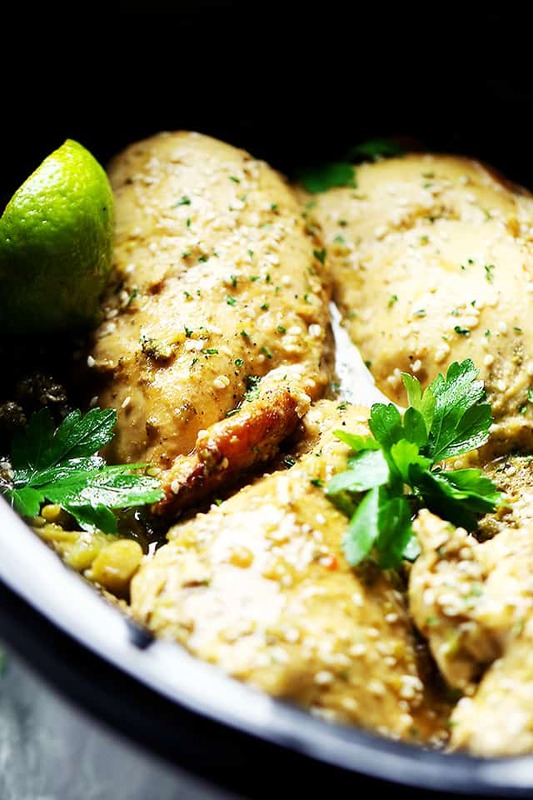 Chicken simmered in an amazing garlic and lime mixture, and cooked to a tender perfection! This is good, you guyyys! So, so good! Hi Hi pals! I’ve come to interrupt your Sunday shenanigans for a moment! Hope you don’t mind, but I come with a perfect chicken recipe that is going to blow you away! I promise. Now, you know I love my slow cooker so, so much, but what happened here was a little accident that led to a delicious, tasty, and dang good Garlic Lime Chicken. Let’s discuss. So. Last week I decided to dust off my pressure cooker and start practicing and testing a few recipes. 4 of them, to be exact. This was my first recipe to test. Everything was going well; prepping, arranging, closing the lid… all that jazz was perfect, BUT because I’m a rookie, the results were a hot. mess. Literally. When I went to release the pressure by slowly turning the lid, all the sauce that was inside the cooker just exploded. My ceiling, my kitchen cabinets, my counter tops! UGH! It was everywhere and it took me a good hour to clean up everything. Clearly, I did not read the manual, as usual, and so, you live and learn. I then decided to go back to my trusted and well known crock pot to do the job. Let’s start with our sauce. What we have is a saucy, tangy and garlicky lime juice mixture with liquid aminos (in place of soy sauce), a bit of worcestershire, some sesame oil, and lots o’ garlic. 2 big cloves or 4 normal sized. Keeping it simple and supreme. We’re going to pour that sauce over the chicken and some carrots. Then, we close the lid, set the crock pot to cook, and that is it. The results are fresh, exciting, vibrant and wonderful. Garlic + Lime just go together like mac and cheese. Cops and robbers. Lock and key! What I am trying to say is that the combination of bright citrus with garlic is just amazing, and when you add all the other ingredients, it’s an easy balance of tangy, sweet, and bright. You’ll see. 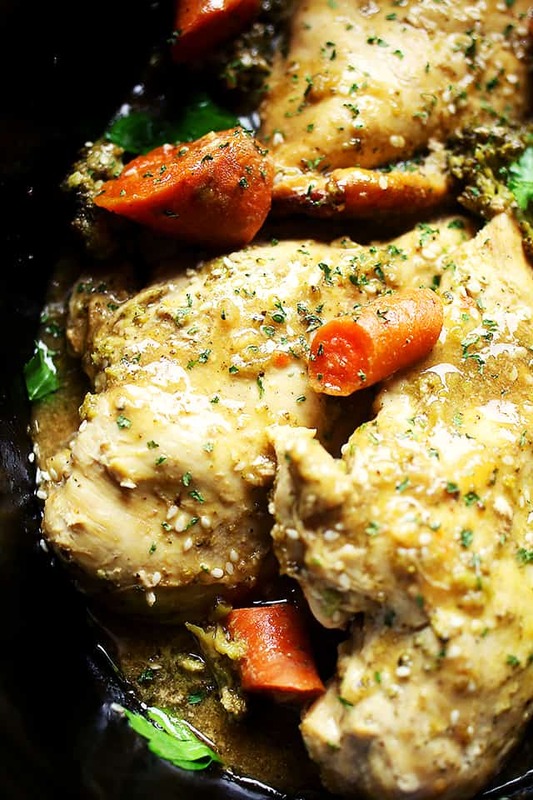 If I were you, I’d get on making this garlic lime chicken right away. Lazy Sundays go best with slow cooked dinners. Just arrange everything in the crock pot, set it on LOW or HIGH, and walk away. Let this amazingness come together low and slow. 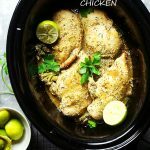 Crock Pot Garlic Lime Chicken - Chicken breasts simmered in an amazing garlic and lime mixture, and cooked to a tender perfection! Season chicken breasts with salt and pepper and arrange on the bottom of your slow cooker insert. Arrange carrots over the chicken. Set aside. 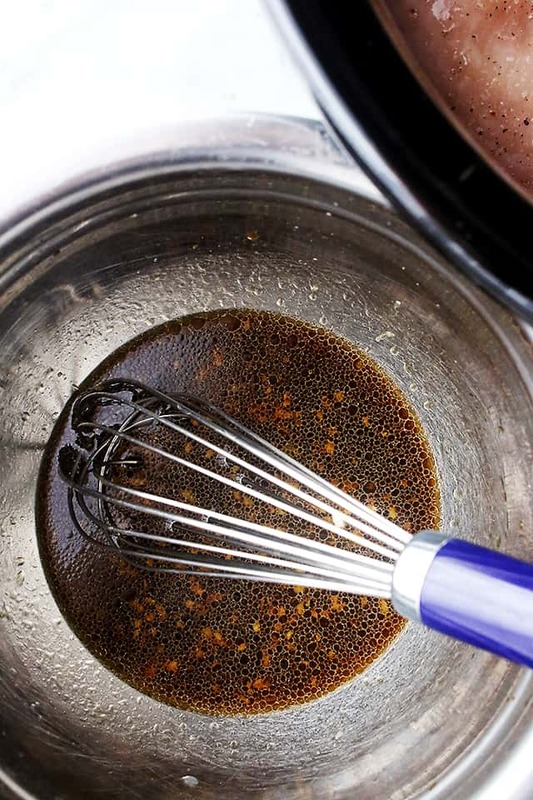 In a small mixing bowl combine lime juice, soy sauce, worcestershire sauce, rice vinegar, sesame oil, and garlic; whisk until thoroughly combined. Pour over chicken and veggies; close with a lid. Spoon 2 tablespoons liquid from the slow cooker into a bowl and whisk cornstarch into the liquid until well combined. Stir the cornstarch mixture back into the slow cooker. Continue to cook on high until the sauce thickens, about 20 to 30 minutes. 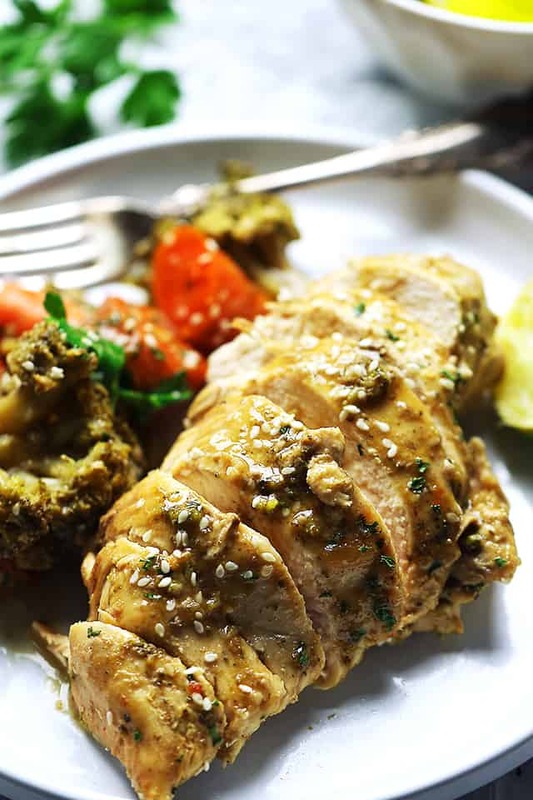 Garnish chicken with toasted sesame seeds and cilantro. I used my insta pot! Had some leftover caramalized onions so I put those as bottom layer. Topped with broccoli florets and baby carrots. Topped with some fresh cilantro. Topped with the sauce ( used soy sauce, no aminos) and I had whisked the cornstarch into the sauce already. Closed the pot and set for 12 minutes. After the cooking ended I let it sit for 10 minutes or do, then released the pressure in small bursts. The result is amazing. A little too salty so maybe more lime and less soy next time. And the broccoli a little too mushy. I’ll steam that separate next time. Served over udon noodles. Topped with a sprinkle of sesame seeds. Delicious. I’ll try this again! Sorry to say, but this is inedible. Chicken breast cooked to the point of tastelessness. Broccoli gray, mushy, and smelly in the worst way. We cooked it on low for 6 hours. Perhaps if we tried 4 hours on low, adding the carrots at the beginning and the broccoli for the last hour, it might have been palatable. But the combo of broccoli and lime didn’t really work in any case. Hey Steve, just in case you haven’t realized your mistake yet, as a few people on here have also made the same mistake, you don’t put the broccoli in the crockpot. It’s an optional side dish. Read a recipe more carefully before leaving bad reviews. Ooh, the flavors of this sound amazing! Plus, you can’t beat the crock pot! What a delicious dinner! 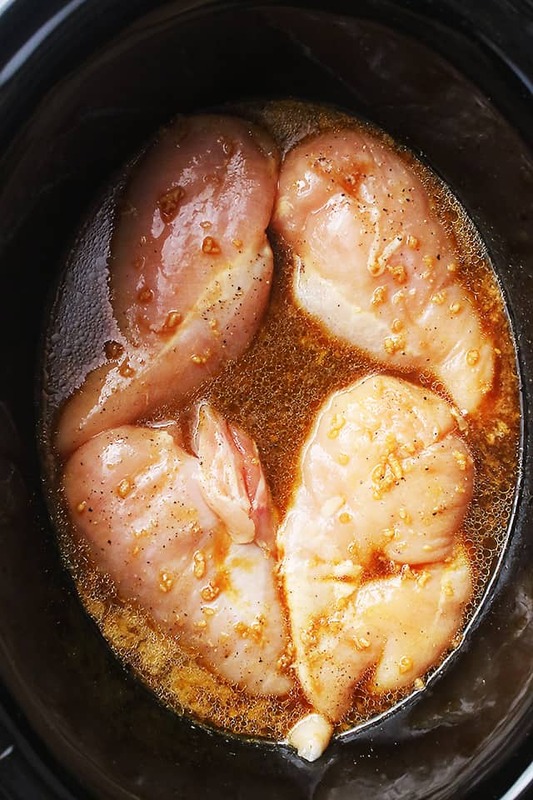 I love the idea of whole chicken breasts in the crock pot! Perfect slow cooker dinner. I love chicken and I’m always looking for new recipes to make with it! Mmmm, this looks so good! 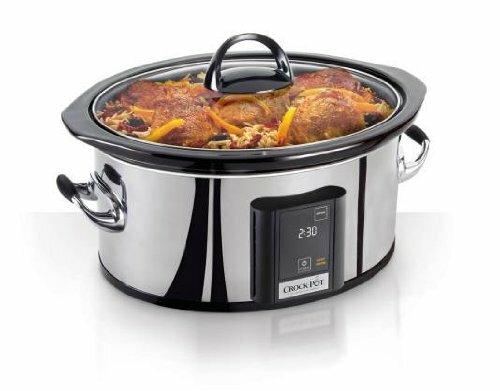 I love the slow cooker idea, I have been stuck in a rut lately with my slow cooker. I have a crock pot – I have only used it once. Time to whip it out again so I can make this!! Yikes, sorry to hear about your pressure cooker mishap. I’ve been diving into cooking with the Instant Pot, but was definitely nervous the first time. Love the flavors in this chicken! Hi Katerina! This was divine! I made a few adjustments to cook it in my pressure cooker (and I would make one other adjustment, in hindsight!). The only major change I made was that I used boneless / skinless chicken thighs, they were on sale for $0.49 / pound and I couldn’t pass that up! Other than that, I just basically doubled the recipe for the sauce, as my pressure cooker pro xl is very picky when it comes to liquid (not enough, and everything burns, too much and I have soup on my hands). When I released the pressure (be warned, this quick release took upwards of 5 minutes!) after 20 minutes cooking on the chicken/meat setting, I scooped out about a cup of the sauce and mixed in about 3 1/2 tablespoons of cornstarch. I then replaced the lid and re-pressurized it on the rice setting for 6 minutes. In hindsight, I would add the broccoli when I added the cornstarch – mine was rather mushy. The carrots were perfect though (imo, cooked carrots should be soft enough to mash with a fork easily, yet still be flavorful). I have to say the flavors blended very well, and the meat absorbed the flavor the same as it would in my crock pot. Thank you so much for this recipe! Thank you thank you thank you so much for sharing this!!! I truly appreciate it! Your recipe is going on my weekend to do list! You realize that your instructions don’t tell you what to do with the lime juice. Hi Dave! Thanks so, so much for letting me know!! It’s there now. Thank you. I assumed that’s where it went, but you never know. I’m making this for dinner tomorrow night! What a frightening experience. One of the many reasons I gave away my mom’s pressure cooker after she passed away. Cause I know I’d hurt myself. Katerina, Please get yourself an electric pressure cooker before you hurt yourself. Thank you, Don!! I am definitely doing that. According to all the reviews on Amazon, the Instant Pot looks like a favorite for many. Will look forward to your excellent recipes for electric pressure cookers! RE: Pressure cooker…electric or not you must let it cool down naturally or use the pressure vent provided to release the steam. I have had an electric cooker for years…no danger if you read and obey ALL the instructions provided.